묘법연화경은 줄여서 ‘법화경’이라고 부르기도 하는데, 우리나라 천태종의 근본경전으로 부처가 되는 길이 누구에게나 열려 있음을 기본 사상으로 하고 있다. 화엄경과 함께 우리나라 불교사상의 확립에 가장 크게 영향을 끼쳤으며, 삼국시대이래 가장 많이 유통된 불교경전이다. 이 책은 후진의 구마라습(鳩摩羅什)이 번역한 것을 고려 충숙왕 17년(1330)에 이신기가 옮겨 쓴 것이다. 병풍처럼 펼쳐서 볼 수 있는 형태로 되어 있으며, 접었을 때의 크기는 세로 28.3㎝, 가로 10.1㎝이다. 표지에는 제목이 금색 글씨로 쓰여 있고, 주위에 4개의 화려한 꽃무늬가 금·은색으로 그려져 있다. 본문은 검푸른 색 종이 위에 은색 글씨로 썼으며, 곳곳에 손상을 입은 흔적이 보이기는 하지만 전반적으로 보존상태가 양호하다. 7권의 끝부분에 나오는 기록을 통해 이신기가 살아 계신 아버지의 장수와 돌아가신 어머니의 명복을 빌기 위해 만들었다는 것을 알 수 있다. 법화경을 정성껏 옮겨 쓴 경전들 중에 비교적 만들어진 연대가 빠르며, 특히 7권이 모두 갖추어져 있어 귀중한 자료로 평가된다. 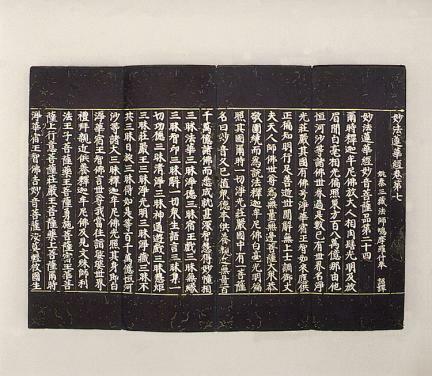 The Sutra of Law and Lotus is also called by its shortened name the Lotus Sutra. 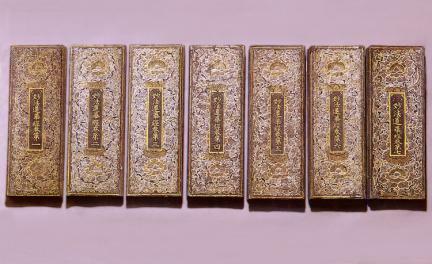 The main idea of the book is that the way to become a Buddha is open to everybody. 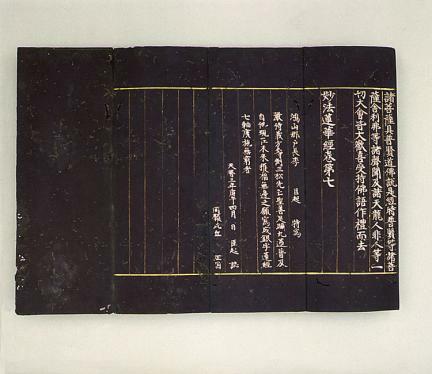 This is the principal scripture of the T'ien-t'ai Sect, a Buddhist sect that, along with the Avatamsaka Sect, influenced most greatly on the establishment of Buddhist philosophy in Korea. 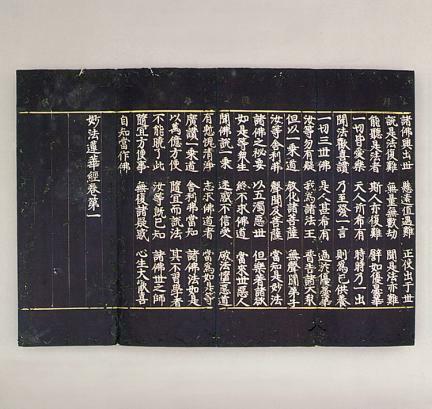 This book consists of seven scriptures originally translated by Kumārajiva of the Late Chin and carefully hand-copied by Yi Sin-gi in 1330 (the 17th year of King Chungsuk of Goryeo). 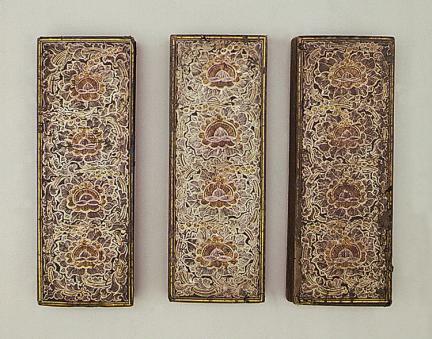 Each piece is made in the form of a folding screen 61cm long and 28.3㎝ wide. 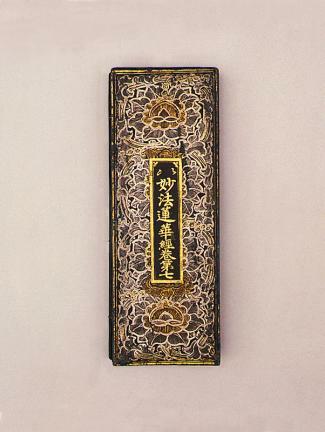 The title on the cover is written in gold and surrounded by four magnificent flowers in gold and silver. 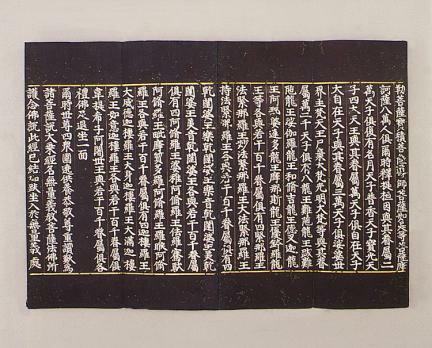 The text is copied in silver on dark blue papers. 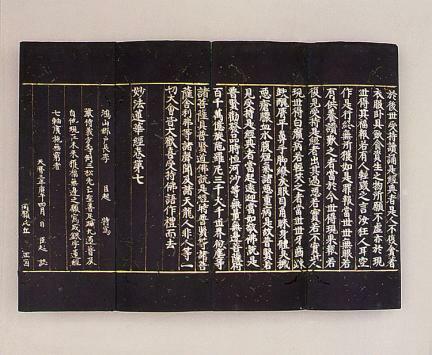 Although the book is damaged in several places, it is preserved in a good condition overall. The story described at the end of Book No. 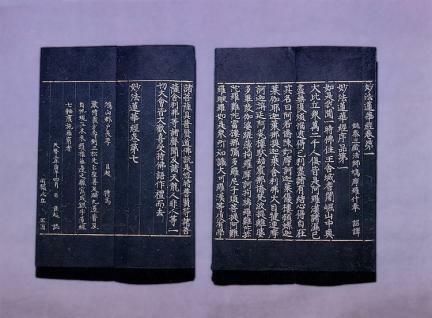 7 tells that Yi Sin-gi made the book with a prayer for the longevity of his own father and the souls of his deceased mother. 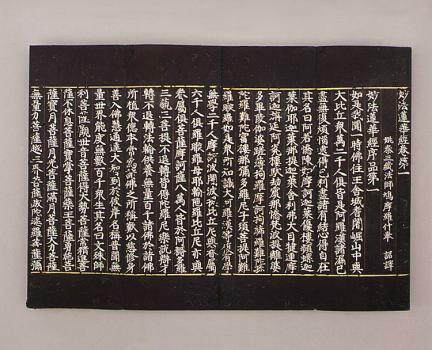 Compared to other hand-copied versions of the Lotus Sutra, this one is made in a relatively earlier period. More importantly, this book contains a complete set of all seven scriptures. 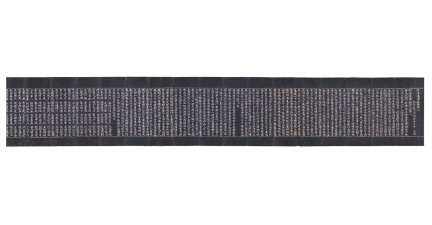 Therefore, it is considered as an important piece of materials for study.